← CJ Box to start national book tour at the AHC! 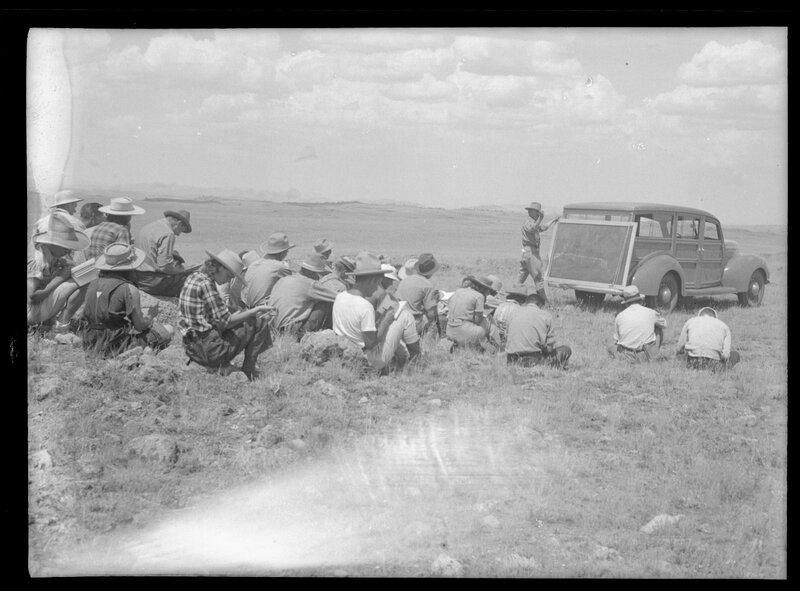 University of Wyoming, American Heritage Center (AHC) has digitized and made accessible online over 3,200 photographs, documents, and 6 films documenting the University of Wyoming science camps and a geology lecture (Chalk Talk) that S.H. Knight gave in the 1960s from the Samuel H. Knight papers. These films were digitized as part of a Wyoming Cultural Trust Fund Grant project to digitize film in our collections that cover different aspects of Wyoming history and culture. 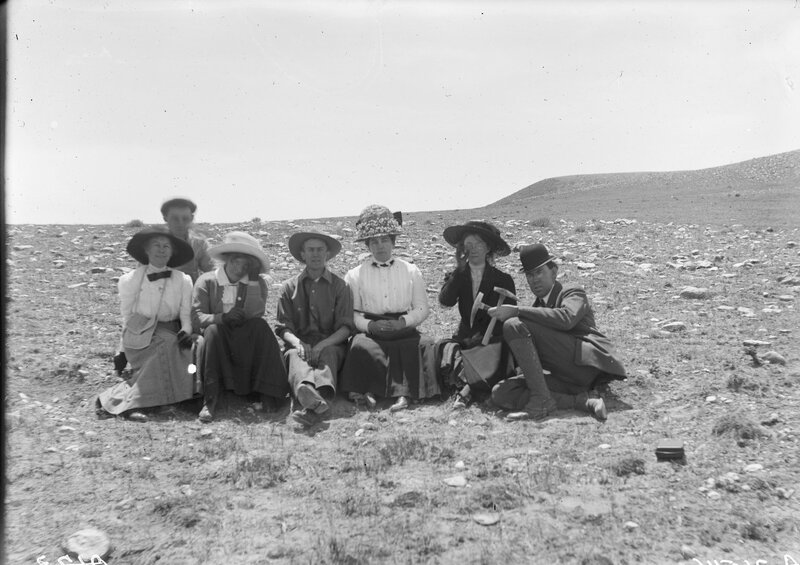 Geology class, Professor A.C. Boyle at right, June 1912. Samuel H. Knight Collection, #400044, Box 86. University of Wyoming, American Heritage Center. Samuel Howell Knight was born in 1892, and soon came to Laramie with his family in 1893. S.H. Knight’s father, Wilbur C. Knight, had accepted a position as the University of Wyoming’s first geology professor. S.H. Knight attended the University of Wyoming as a prep student and an undergraduate from 1907 to 1913. He attended Columbia University in New York from 1914 to 1916 for his graduate studies. He then joined the University of Wyoming faculty in 1916 as assistant professor of geology and curator of the Geological Museum. He became a full professor and the department head in 1917. Also in 1917, S. H. Knight served in World War I in the capacity of First Lieutenant in military intelligence. In 1925, S.H. Knight established the University of Wyoming Science Camp in the Medicine Bow Mountains, about 35 miles from Laramie. The camp ran from 1925 to 1976. As a researcher, his interests ranged from the rounding of sand grains by wind transportation to the physical evolution of the mountains and depositional basins of southeastern Wyoming. Collection includes materials pertaining to several aspects of S.H. Knight’s life, including geology research, teaching, and University of Wyoming activities. A geology course lecture, while en route to research site, ca. 1940. Samuel H. Knight Collection, #400044, Box 97. University of Wyoming, American Heritage Center. Links to digitized items and additional information about the Samuel H. Knight papers can be found in the on-line finding aid at: http://rmoa.unm.edu/docviewer.php?docId=wyu-ah400044.xml. If you have any questions or comments, we’d love to hear from you! Please contact Jamie Greene in the AHC’s Digital Programs Department at jgreene@uwyo.edu or 307-766-3704. This entry was posted in Geology, newly digitized collections, Student Life, University of Wyoming history and tagged geology students, S.H. Knight papers, science camp. Bookmark the permalink.